This week, Governor Walker Signed Assembly Bill 773 (AB 773) which contains a number of civil litigation reforms. Representative Mark Born and John Nygren, along with Senators Dave Craig and Tom Tiffany, deserve a great deal of credit for getting this comprehensive package of reforms passed before the close of the legislative session. After completing other key priorities by the end of February, the passage of AB 773 became a top priority during the closing days of the legislative session mid-March. During the end of this session, AB 773 appeared to be “dead” a number of times, so passage of the final version of the bill was the result of a great deal of effort by the WBA, the Wisconsin Civil Justice Council, the Wisconsin Insurance Alliance, the Wisconsin Manufacturers and Commerce, and the National Federation of Independent Business. This bill focuses on a number of areas, including the scope of discovery, mandatory disclosures of third party litigation financing, automatic stay of discovery, production of certain categories of electronically stored information, limits on discovery methods, reforms to class actions, changes to the statutes of limitations, interest rates on untimely payment of insurance claims, audits of unclaimed property, and--most notably for WBA members--changes to the statute of repose that result from deficiency or defect to an improvement to real property. Under current law, the exposure period for such a claim resulting from a building or remodeling project is typically 10 years from substantial completion of the improvements. However, if the damages are sustained during years 8 through 10 from substantial completion, the time to commence an action is extended 3 additional years, making it 13 years. AB 773 amends current law to provide an exposure period of 7 years. AB 773 also provides that if the damages are sustained in years 5 through 7, then the time for commencing an action is extended 3 additional years. Thus, the exposure period would be up to 10 years instead of 13. Now that AB 773 has been signed into law, Wisconsin joins Connecticut as the only two states that have a 7-year statute of repose. 30 states now have longer statute or repose for construction defects which range in years from 8 to 13. For more detailed summary of AB 773, click here. After several changes during the legislative process in both the state assembly and the state senate, the legislation to reform and streamline the permitting process to build in areas that contain wetlands was signed into law last week. Assembly Bill 547, authored by Senator Roger Roth and Representative Jim Steineke, became 2017 Wisconsin Act 183 with Governor Walker’s signature on Wednesday, March 28, 2018. For an additional summary of 2017 Wisconsin Act 183, click here and go to the bottom of page three under the heading “Assembly Substitute Amendment 3” (ASA 3). ASA 3 was the text of the bill that was ultimately signed into law and the summary provided in the above link is a summary of the bill that became 2017 Wisconsin Act 183. We believe that this package of changes will allow for a streamlined process for housing development, which will ultimately help drive down the cost of the development process and reduce the cost of housing for Wisconsin families. A special thank you is due to members who helped review and craft this legislation, and to those of you that used the VoterVoice system to reach out to members of the Wisconsin legislature in support of this legislation. Outside of a state budget, it is rare to craft a piece of legislation that has as many housing wins as 2017 Assembly Bill 770 (AB 770). Discussion on AB 770 began early in 2017 and continued as the legislation was changed in committee with one additional small change coming on the floor of the state senate very late in the process. Representative Rob Brooks and his staff member Christopher Schaefer deserve a huge “thank you” for all the hard work they put into crafting, introducing, and making changes to AB 770. While not all municipal government advocacy groups at the end supported all of the provisions of AB 770, Representative Brooks made several changes to the original bill to get more support during the process. Another thank you goes out to Senator Duey Stroebel for taking on a leadership role on this bill after the lead author, former Senator Frank Lasee, left his position to take a role in Governor Walker’s administration. Changes to provide clarifications and greater flexibility for developers to use bonds in the dedication of infrastructure that is paid for by a developer and dedicated to a municipality. These are clarifications of 2013 Wisconsin Act 280 which passed the legislature on voice votes in both houses. Prohibits a developer’s agreement from mandating building codes that exceed the statewide uniform standards of the Uniform Dwelling Code. AB 770 as of today is now 2017 Wisconsin Act 243 and the text of the act can be found here. The third WBA-supported bill to be signed into law on April 2nd was Senate Bill 394 (SB 394), authored by Representative John Jagler and Senator Frank Lasee. SB 394 merges the functions of the Building Inspector Review Board and the Contractor Certification Council to the duties of the Uniform Dwelling Code Council. This provision was initially part of Governor Walker’s state budget, but was removed as policy at the start of the budget process. Passage of SB 394, now 2017 Wisconsin Act 240, will bring some additional efficiencies to the Department of Safety and Professional Services while maintaining the public policy objectives of both boards and transferring those duties to the Uniform Dwelling Code Council. Looking for a Speaker to Tell the Good News? The summary of the four bills that recently became law are just some of the public policy changes WBA’s advocacy efforts were able to get passed into law this year. If you are interested in having a member of the WBA leadership team come to your local to discuss these wins for lowering the cost of housing for Wisconsin families as part of your board of directors, advocacy, or general membership meeting, please contact Brad Boycks (bboycks@wisbuild.org). Join DSPS for Our Spring Session of "Ask the Code Official"
We won’t be able to respond to project specific questions. If received, we will route to the appropriate Tech Box for review and follow up. Due to timeframes, not all submitted questions will necessarily be covered or answered during the teleconference. 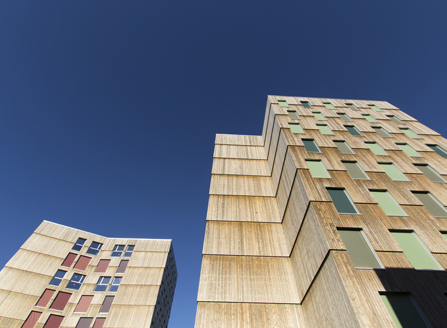 Proposals for an innovative method of wood construction that could allow 18-story wood residential buildings face their first key vote for incorporation in the 2021 edition of the International Code Council’s International Building Code. After 18 months of intense deliberations, ICC’s Ad-Hoc Committee on Tall Wood Buildings (ICC-TWB) submitted 14 code change proposals that would add provisions for mass timber buildings exceeding the traditional height and area limits for “heavy timber” construction. The proposals will be debated at the upcoming ICC 2018 Group A Committee Action Hearings in Columbus, Ohio April 15-23. The key proposals are on the agenda for the IBC-General Committee and expected to be heard either Monday, April 16 or Tuesday. April 17. Registration for the hearings is free. During recent meetings to review the Group A code changes, members of NAHB’s Construction, Codes & Standards Committee agreed to support the ICC-TWB’s proposals. NAHB believes our multifamily builders may find mass timber an appealing option for mid-rise residential and mixed-use buildings. Mass timber beams, columns, panels and other elements are fabricated under controlled conditions in a factory, reducing the need for on-site labor. Fire tests conducted last year show mass timber components have inherent fire resistance, reducing the risk from fires during construction. Mass timber components can also make use of lumber from trees killed by the pine beetle that would otherwise be of limited use in construction. ICC established the ad-hoc committee at the request of the American Wood Council and other stakeholders following considerable debate over several proposals during the hearings for the 2018 International Codes. The committee consists of structural engineers, architects, building and fire officials, and representatives from the wood, concrete and steel industries. NAHB staff will attend the 2018 Group A Committee Action Hearings to testify on this and other issues affecting residential construction. Multifamily builders with an interest in mass timber – or building codes in general – are welcome to attend the hearings and testify on these items or other proposals of concern. For information about the ICC Committee Action Hearings or mass timber construction, contact Gary Ehrlich at 800-368-5242 x8545.